As a New Englander accustomed to long, cold winters, I had never put the Arctic Circle atop my summer vacation list. But in case you missed the billboards along Interstate 91, Norwegian Air now offers discount flights to Europe from Boston, Providence, and New York City, some priced at around $100 (sadly, service into Hartford was short-lived). 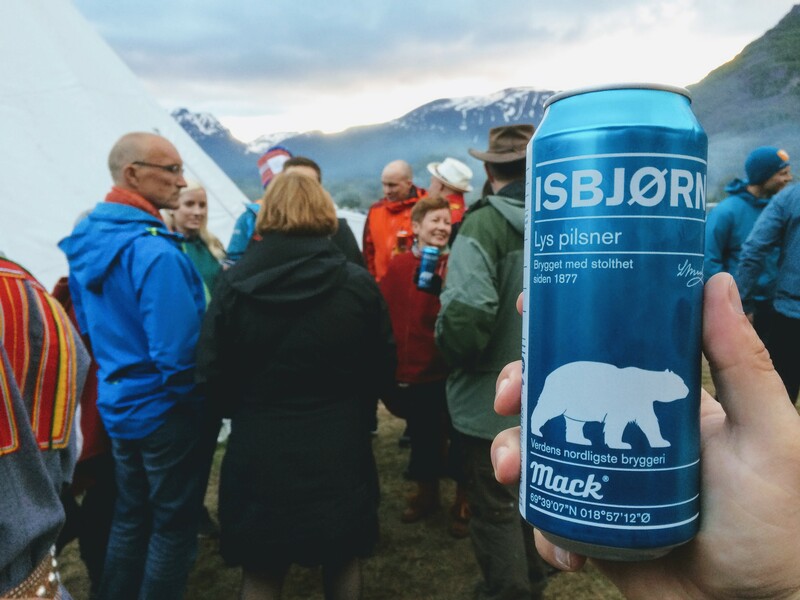 The Norwegian pilsner called Isbjørn, or “polar bear,” is made by Mack, the northernmost brewery in the world. Hunter Styles photo. That’s how I found myself in the Arctic last July, dancing to Nordic pop music at the Riddu Riddu music festival. When the sun set at midnight, birds sang. When the sun rose at 1 a.m., birds sang again. We laughed among new friends and fellow tent-campers in light jackets, nourished by reindeer kebab and bowls of whale stew. 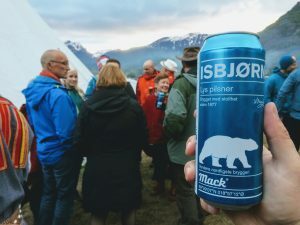 I washed it all down with a Norwegian pilsner called Isbjørn, or “polar bear.” It’s made by the historic Mack brewery, which claims to be the northernmost brewery in the world. On the Arctic island of Tromsø, it’s still possible to tour the original site of the brewery, which opened in 1877. Back then, the building had no cooling system — all beer was brewed in the winter and kept cold with hand-cut blocks of ice. In 1928 the brewery opened Ølhallen, the ale hall next door, where cold beer hit the bar taps via pipelines from the brewery’s cellar. Ølhallen has 67 taps, 50 of which are for microbrews. 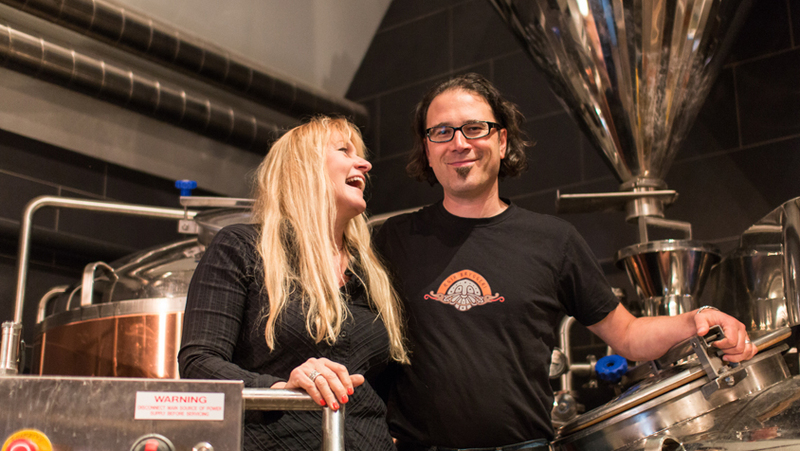 “That makes this, by my knowledge, the biggest micro beer bar in northern Europe,” she says. American Evan Lewis and his Norwegian wife Aud Melås moved from California back to Norway to found Ægir craft brewery in 2007, when the craft beer industry in Norway was virtually non-existent. Arnold Lan photo. Although I don’t expect many Americans to flock that far north, many are responding to Norwegian Air’s new, cheap portal to Europe. Tourism in Norway is booming, for better or worse. American expat Evan Lewis founded the Ægir craft brewery in Flåm in 2007, following in the footsteps of first-generation Norwegian craft breweries like Nøgne Ø and Haandbryggeriet. He says the craft beer industry was virtually non-existent here two decades ago. Today, his town of 350 greets nearly half a million tourists annually. He and his Norwegian wife Aud Melås have built out their brewpub and hotel to accommodate the influx, largely from cruise ships. Norway’s population is less than that of Massachusetts, but the country is twice as long as California. In this spread-out landscape of rural small towns, such an explosion of new beer styles has some old-world beer drinkers puzzled, says Lewis. Several new high-production breweries here focus on fast growth. But Espen Lothe, the brewmaster at Kinn Bryggeri in Florø, suggests that the key to success is to start small. 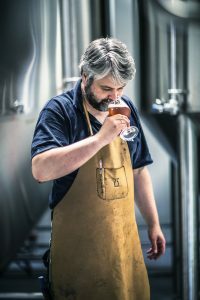 In 2009 Lothe began to scale up his homebrewing with a focus on open-fermented, bottle-conditioned English and Belgian styles. 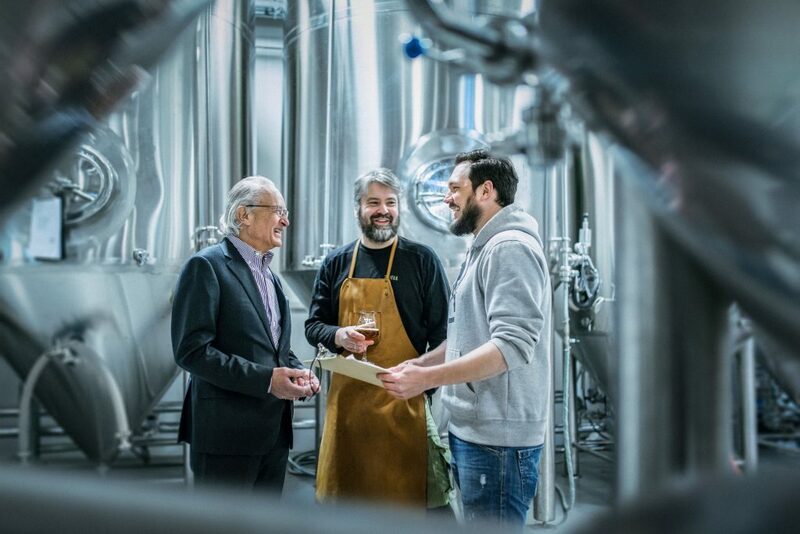 Stakeholder and coffee executive Herman Friele (left) meets with 7 Fjell Bryggeri’s brew master Gahr Smith-Gahrsen (center) and CEO Jens Eikeset (right) in Bergen, Norway. KIND photo. 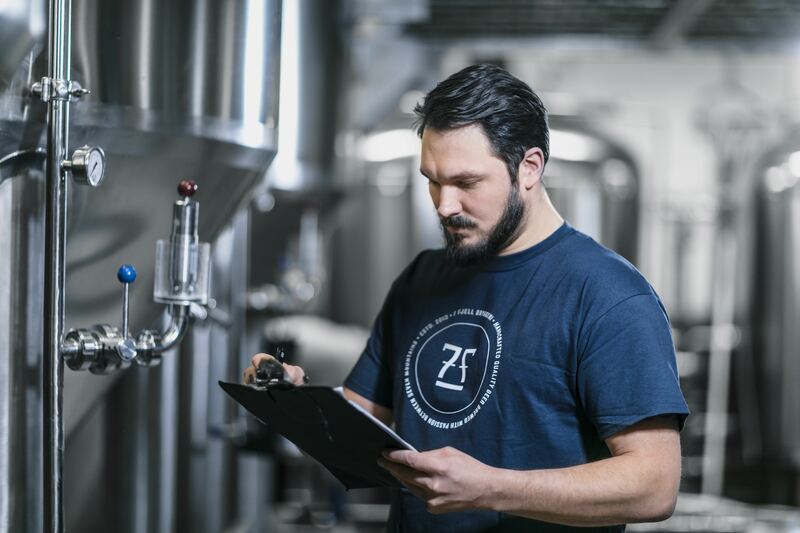 Beers from the Ægir and Kinn breweries can now be found all over Norway, but Lewis and Lothe each maintain a microbrewery at their original sites. Thanks to Norway’s modern rail system, many rural towns are easily reached by train. There is plenty to do in the capital city of Oslo as well. The native population largely skips town in the summer, leaving behind a city roughly the size of Boston that’s walkable, uncrowded, and full of cool art and fun festivals. Plus, most Norwegians are fluent in English. Now here’s the catch: although many museums and events in Oslo are free, the city itself is the most expensive in the world for travellers. Last year, Deutsche Bank Research calculated the average price of “one beer in a neighborhood pub” around the world, and Oslo tops the list, since many downtown bars charge about $10 for a pint (but, hey, Boston comes in number five on that list). Norway also places a steep tax on alcohol sold in bottles and cans. On top of that, the state-owned network of stores called the Vinmonopolet (literally “the wine monopoly”) was founded by Norway’s government in the 1920s “to remove the private profit motive from sales of wine, spirits, and strong beer,” making it the only entity in Norway that sells alcoholic beverages with an ABV (alcoholic content) higher than 4.75 percent. Such limited access and heavy taxation are intentional, due to this cold and relatively isolated European country’s conflicted relationship with alcohol, and substance abuse, over the centuries. Hand-crafted beer in Norway is as old as the Vikings. In pre-industrial Norway, many farms functioned in a manner similar to American “company towns,” with community members working in service of one family’s business. Beer remained central to daily life, and until 200 years ago, most farms in Norway featured a brewhouse. CEO Jens Eikeset at 7 Fjell Bryggeri in Bergen, Norway. KIND photo. But in the mid-1800s, as the industrial revolution arrived and alcohol consumption rose (largely among the poor and working classes), new regulations began to crop up, as did religious temperance societies (even today, about 70 percent of Norwegians are members of the Protestant Church of Norway). Total prohibition of liquor and fortified wines arrived in 1917, and lasted for about 10 years (sound familiar?) until the founding of the Vinmonopolet. Because of all this, Norway lacked a small-scale beer industry for much of the 20th century. Over the past 50 years, Norway’s rather bland array of pilsners has been consolidated under two giant beer companies: Carlsberg-Ringnes and Hansa-Borg. This crowds out craft beers not only on store shelves but also on draft, since Norwegian bars commonly sign a contract with one of those two giant companies to exclusively carry either Ringnes or Hansa beer — much like how American restaurants serve either Coke or Pepsi — in exchange for a newly-installed tap system free of charge. But craft beer is born in strange places. When Ringnes bought up a local brewery called Tou in the city of Stavanger, then abruptly closed the facility, residents were left with no local beer to drink. They re-opened the building in 2003 as Lervig Aktiebryggeri. In 2010, American-born brewer Mike Murphy took over. Murphy was raised in Philadelphia, then ran breweries in Italy and Denmark before moving to Norway. His former roommate is Shaun Hill, the founder of Hill Farmstead Brewery in Vermont. In return, Murphy launched successful ales like Lucky Jack, which have helped to turn Lervig into a 25,000-liter brewhouse that exports beer all around the world, including to America. It doesn’t always cost an arm and leg to get your hands on good Norwegian beer. 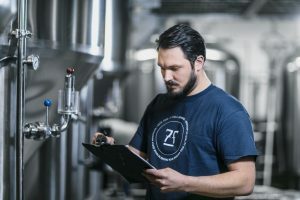 The variety is good at the Vinmonopolet, and many Norwegian craft breweries hold events, tours, and tastings, in addition to participating in a staggering number of beer festivals. Oslo has several brewpubs. The Oslo Mikrobryggeri is the oldest in Scandinavia, although my three personal favorites are the pub run by Amundsen Bryggeri, an underground brick cellar brewery called Schouskjelleren Mikrobryggeri, and a delicious place called Crow, which also serves kebab, pork cracklings, and roast suckling pig marinated in stout. There is much to be found in the grocery stores as well, despite the limit of 4.75 percent ABV. My favorites include a milk stout from Hogna Brygg, a session IPA from Ægir called Vetlebror (“little brother”), an outdoor IPA from Austmann Bryggeri called Onkel i Amerika (“uncle in America”), a wheat beer called Kvit Øl from Voss Fellesbryggeri, and a New England IPA by Amundsen called Chuggernaut (a collaboration with Devil’s Peak in South Africa). There are many more to try. If you’re lucky, you’ll find one that includes some especially Scandinavian ingredients like birch sap, berries, or juniper (one smoked example made in the city of Drammen is called, of course, Norwegian Wood). It can be tough to estimate the number of craft breweries in Norway, but there seem to be around 150, for a population of 5.2 million. That means Norway has roughly 30 percent more craft breweries per person than we currently have in Massachusetts. And despite the squeeze from corporate beer behemoths, the craft beer market in Norway is maturing. Brew Master Gahr Smith-Gahrsen at 7 Fjell Bryggeri in Bergen, Norway. KIND photo. Over the past three years, sales at 7 Fjell have increased tenfold, making it the fourth largest independent craft brewery in Norway, based on domestic sales. With its new increased capacity, 7 Fjell is looking to start exporting (Eikeset says he is currently seeking an American importer). His ultimate goal is apparent from the hashtag printed on the bottom of all 7 Fjell beer cases. It reads: #totalworlddomination. Next stop: the United States.